Hook burst onto the international scene with a try on debut against Argentina during Wales' 2006 summer tour. The young outside-half had been a prolific points scorer in the Principality Premiership for Neath, and his performances on tour led to his inclusion in the Ospreys regional squad for the first time the following season. A man of the match performance as a replacement for injured Wales captain Stephen Jones against Australia in the autumn of 2006 further increased Hook's stock, but his early international career faltered as he was increasingly played at inside centre by Welsh coach Gareth Jenkins. Included in the squad for the 2007 Six Nations, Hook failed to impress at 12 until the final game against England, where from outside half he completed a full house of a try, four penalties, a drop goal and a conversion, claiming another man of the match award. Later that year, Hook was included in the squad for the disastrous 2007 World Cup campaign that saw the team crash out to Fiji at the end of the group stages. Hook bounced back in his second Six Nations tournament as he helped Wales to a famous Grand Slam, scoring crucial conversions against England and a superb solo try against Scotland. Under new Wales coach Warren Gatland, Hook found himself sharing the outside half berth with the more experienced Stephen Jones. Hook's free flowing creativity took a back seat to the more physical and assured Jones in several internationals, including Wales' Triple Crown win against Ireland at Croke Park. During Wales' 2008 tour of South Africa Hook was forced to watch from the substitute's bench as Wales suffered a heavy defeat in the first Test. Coach Gatland was sufficiently convinced of Wales' need for Hook's expansive kicking game in the second clash, installing him at fullback. Hook's assured display under the high ball belied his inexperience, having not played in the position at professional level, but the changes couldn't stop Wales again slipping to defeat. The 2007-08 season turned out to be a good one for Hook, as both he and the Welsh team recovered well from World Cup disappointment. Hook was also instrumental in the Ospreys victory over Leicester in the Anglo-Welsh Cup final at Twickenham, turning in a performance of grace and poise as he orchestrated the demise of Marcello Loffreda's men. During the 2009 Six Nations Hook slipped behind Jones in the pecking order, making three appearances from the replacements bench before finally winning a start against Italy in Rome. And although originally missing out on selection for the British & Irish Lions' tour to South Africa he was later drafted in for injured compatriot Leigh Halfpenny. Hook missed out on selection for the first two Test squads and was an unused replacement for the third Test in Johannesburg. In November he was called in as cover at fullback after an injury to Lee Byrne, playing all of Wales' Tests. At domestic level Hook was deployed in the centre to accommodate Dan Biggar and he began the 2010 Six Nations in his fourth position at Test level, outside-centre. He turned in a brilliant display in defeat to England, scoring an individual try. Hook continued to play in the centre for the Ospreys and Wales, winning the Magners League before undergoing surgery on a troublesome shoulder injury. In 2011, Hook's circumstances changed. He agreed a move away from the Ospreys, signing for French giants Perpignan, while in the Six Nations he finally regained the fly-half berth for his country, starring against Scotland as Wales ended a long barren run. However Rhys Priestland impressed at fly-half during the World Cup warm-up games and Hook started the tournament at fullback. An injury against Samoa kept him out of the remaining pool games but he returned for the quarter final against Ireland, although he had to make do with a place on the bench. He came on to replace the injured Priestland and kept his place for the semi final against France with Priestland failing to recover. Hook endured a difficult game and missed a couple of crucial kicks that would have seen Wales progress to the final. On returning from the World Cup he began his career with Perpignan. 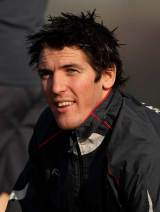 But despite plying his trade across the Channel, Hook kept his place in the Wales set-up for the 2012 Six Nations. Halfpenny had retained the fullback berth and Priestland got the nod at fly-half so Hook was relegated to the bench. He was restricted to just three appearances from the bench but still collected the Six Nations' winners medal.